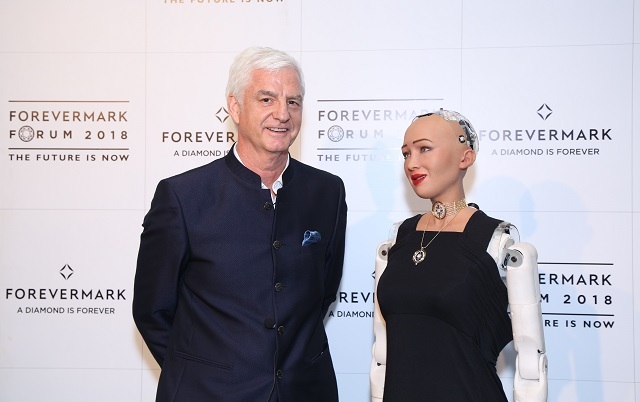 (IDEX Online) – The 7th edition of the Forevermark Forum took place this week in Delhi, with the highlight being the presence of “Sophia”, an advanced social humanoid robot developed by Hong Kong-based company Hanson Robotics. The Forevermark meeting provides a platform for partners to interact, transact and gain a new perspective on Forevermark’s growth in the context of events within and outside the industry. Sophia, modeled after actress Audrey Hepburn, is known for her human-like appearance and behavior compared to previous robotic variants. Sophia expressed her ability to participate in the whole process of selecting a Forevermark diamond and identifying its characteristics with Stephen Lussier, CEO Forevermark and Sachin Jain, President, Forevermark. A first for any Artificial Intelligence!